The Tiffen 77mm UV Protector Filter is a general use, clear filter that helps to absorb ultraviolet light and reduce the bluish cast of daylight. This filter is especially useful when photographing at high altitudes or around bodies of water. No additional coloration or contrast is provided, allowing you to pair this filter with others. 77mm UV Protector Filter is rated 4.6 out of 5 by 584. Rated 1 out of 5 by Larry from More trouble than good... I found that this filter actually slowed my lens down. Camera metering selected faster shutter speeds across all apertures when the filter wasn't used and I never had this problem with other lens using UV protectors from different brands. The filter also induced flaring when my lens was wide open and a bright light source was in the shot. I repeated the shot without the filter and the issue cleared up. So yes, this filter is cheap and if you're spending good money on good glass, this filter will only diminish your investment. Rated 5 out of 5 by J.T. from Always protect your lenses with filters When I got into photography, one of the first things I was told was to always have a protective filter on the end of my lenses to protect the glass. It's much easier to replace a filter than a very expensive lens. Years later, I found myself changing lenses on a rocky surface, and, for the first time, I dropped a lens. It was my most expensive lens... a nice wide angle with a bubbled out glass.. The Tiffen filter on the end shattered into a hundred pieces, but it saved the lens. It works fine, and the glass below didn't get harmed at all. These protective filters are a MUST and will help save you in a split second. Rated 5 out of 5 by Ed from Great price point filter.... My gear is used 100% in Kenya in locations varying from urban slums to desolate northern deserts. 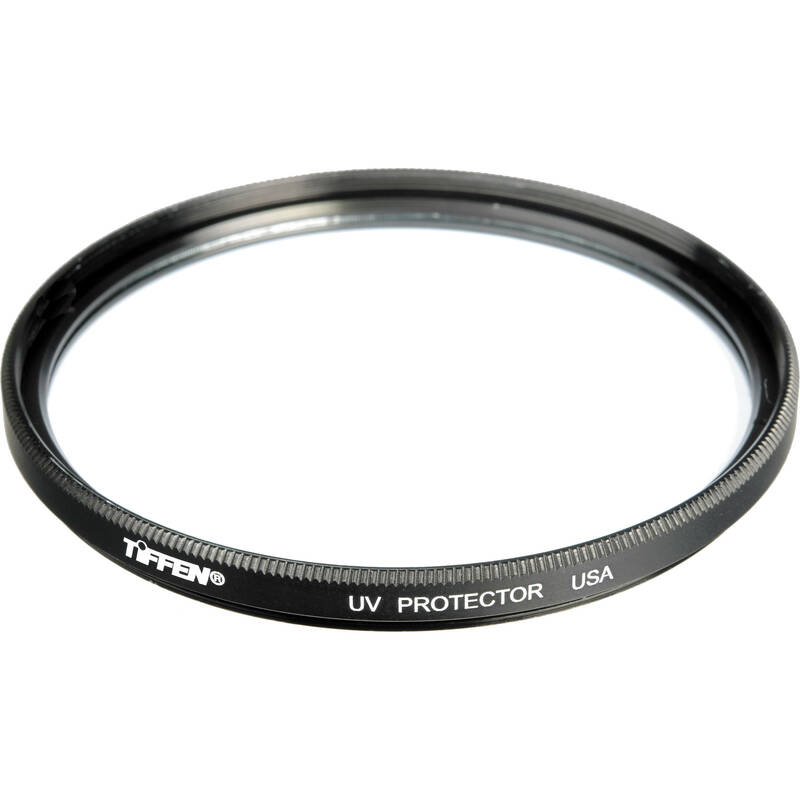 The Tiffen UV filter has a very low cool factor, but it has a very effective and practical factor to it. By that I mean that though it does not say BW or Nikon, it is still an excellent filter at a fraction of the price. It is used on my Nikon 20-35 f2.8 and if it gets scratched, or even broken, I will not cry, but simply replace it. Pay the big bucks for a big named filter if you really think it will improve your photography, but I've used Tiffen for years and have no complaints. By the way, I've also used some of the other brands and have never seen a difference. Rated 5 out of 5 by Picturemark from 77mm UV filter by Tiffen I bought a couple because of the low price just to see how they performed. I primarily wanted a protective filter in front of my expensive lens elements and they do the job just fine. These are not super thin filter rings so they may not work on really wide lenses but they do feature front filter threads if you want to stack them with other filters (although I'd just remove it and put on a polarizer for instance). There are other versions of this filter that cut more UV rays but this will keep the grit off your lens very well. These are cheap enough to spray with hairspray, or other modifications to use for special effects. I have ordered two more 77's and one 58mm already. Rated 1 out of 5 by Dr.JamesWilliamson from Flares excessively I just received the AF-S NIKKOR 24-120mm ED VR lense from B&H. This filter was included in the filter twin pack at no extra charge. At first I thought that was so nice of B&H to include this bonus with my purchase. But as it turns out, including this filter pack was a mistake on B&H's part as it just led to a waste of my time. The UV Protection filter flares excessively and should be recycled rather than used in any optical system. I just replaced this inferior filter with the Nikon 77mm Clear NC Glass Filter, which functions beautifully. I doubt I will ever try the Tiffen Circular Polarizing filter as Tiffen has such a black eye from producing the junky UV Proetction filter. Rated 4 out of 5 by Jake from State Farm from Does the job I use this to protect my glass on the Tokina 11-16mm. Its serves its purpose. Rated 1 out of 5 by Anonymous from You get what you pay for I bought this in a pinch hoping I could get away with a cheep UV filter. After using it I quickly noticed how horribly this filter enhanced flares that normally wouldn't have been an issue. I literally have to take this filter off if there are any light sources, not only in image, but also any light sources in a 120 degree angle of the lens. It does a fine job protecting the front element and does not seem to effect the image at all but in my opinion I would just spend the extra $50-$75 and buy the better filter. While some Tiffen filters are multi-coated, the Tiffen 77mm UV Protector Filter listed above is not. The Tiffen 77mm UV Haze 86 Digital HT Filter, B&amp;H # TIH86DHT77, would be the only 77mm UV filter from Tiffen which would be multi-coated. Do this product fits with a Canon 70-200 mm f/2.8L USM lens?If not what size should I choose? Yes, the Tiffen 77mm UV Protector Filter would be fully compatible with the Canon 70-200mm f/2.8L EF USM lens. will this filter touch the glasson canon 16-35mm f4lis usm lens ? We cannot test with every single lens available on the market, however when using this same lens in f/2.8 we had no issues. i need to buy a uv filter for tokina 11-16mm pro DX-II lens. can you tell me if this is the right uv filter to buy or do I need to get the more expensive uv filter for a wide angle lens? Just purchased the B+W 77mm Kaesemann Circular Polarizer MRC Filter B&amp;H # BWKCPMC77 and also have this Tiffen UV protector filter. Does the B+W Polarizer simply replaces this filter and acts as a UV Protector -or- can you mount on top of the Tiffen filter. Any benefits of doing this. It seems that if one were to do this there would be issues with.......? The Tiffen serves as your protection for all general purposes. As much as the Kaesemann filter costs, I personally would put the Tiffen on the outside to protect it, or just leave the Tiffen off when using the polarizer for the optimal results. I would not recommend leaving the Circular Polarizer on for all occasions as it causes 2-stops of light loss (which is not usefull for most indoor/low light situations) and is mostly only useful in outdoor situations. will the haida filter system work with this filter atached? I would like to get this filter but don't know if it will fit my lens. It is a Nikkor 70-300mm 1:4.5-5.6G lens. How do I know the size I need? The Nikkor 70-300mm 1:4.5-5.6G lens takes a 67mm filter. That's a good filter but you will need the 67mm version. Anyone have experience with this filter on Sigma 50mm Art 1.4? Yes. Its sturdy and Im hard on cameras. Filter quality also good. Would recommend.